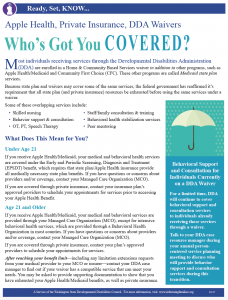 Most individuals receiving services through the Developmental Disabilities Administration (DDA) are enrolled in a Home & Community Based Services waiver in addition to other programs, such as Apple Health/Medicaid and Community First Choice (CFC). These other programs are called Medicaid state plan services. Because state plan and waivers may cover some of the same services, the federal government has reaffirmed its requirement that all state plan (and private insurance) resources be exhausted before using the same services under a waiver. If you receive Apple Health/Medicaid, your medical and behavioral health services are covered under the Early and Periodic Screening, Diagnosis and Treatment (EPSDT) benefit, which requires that state plan/Apple Health insurance provide all medically necessary state plan benefits. If you have questions or concerns about providers and/or coverage, contact your Managed Care Organization (MCO). If you are covered through private insurance, contact your insurance plan’s approved providers to schedule your appointments for services prior to accessing your Apple Health Benefit. If you receive Apple Health/Medicaid, your medical and behavioral services are provided through your Managed Care Organization (MCO), except for intensive behavioral health services, which are provided through a Behavioral Health Organization in most counties. If you have questions or concerns about providers and/or coverage, contact your Managed Care Organization (MCO). If you are covered through private insurance, contact your plan’s approved providers to schedule your appointments for services. After reaching your benefit limit—including any limitation extensions requests from your medical provider to your MCO or insurer—contact your DDA case manager to find out if your waiver has a compatible service that can meet your needs. You may be asked to provide supporting documentation to show that you have exhausted your Apple Health/Medicaid benefits, as well as private insurance. For a limited time, DDA will continue to cover behavioral support and consultation services to individuals who are 20 years or younger and already receiving those services through a waiver. Talk to your DDA case resource manager during your annual person-centered service planning meeting to discuss who will provide behavior support and consultation services during this transition.